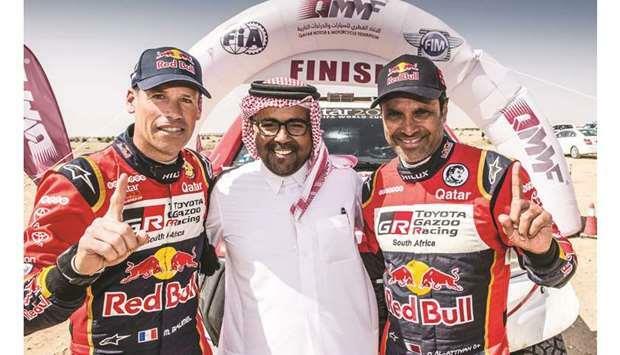 (MENAFN - Gulf Times) After his dominant victory in the Manateq Qatar Cross-Country Rally on Tuesday, Qatar's Nasser Saleh al-Attiyah has set his sights on clinching the overall title. The Qatar leg was the opening round of the FIA World Cup for Cross-Country Rallies and al-Attiyah, who won the Dakar Rally for the third time in January with French navigator Matthieu Baumel, is gunning for another title. It was start-to-finish win for the local hero, as he conquered Qatar's desert terrain for his sixth victory in the eight years that the event has been a round of the FIA series. Al-Attiyah had also won the candidate event when it was called the Qatar International Baja in 2011. 'This victory is a first step and it will serve me as a motivation to regain the World Cup title. Last year the car was in development but this year we have hit the stride and everything looks positive for the rest of the season, said al-Attiyah, who the FIA World Cup last time in 2017. Al-Attiyah's quest for World Cup title received further boost as defending champion and his main rival Jakub Przygonski was excluded from Qatar Cross-Country Rally. The Pole and his Belgian co-driver Tom Colsoul had finished third in their MINI John Cooper but at post-event scrutineering the car was found to be four kilogrammes underweight, which did not conform to FIA T1 regulations. 'Qatar Rally is one of the most difficult rallies in the region because of its ruggedness. Overall it was not a difficult rally but the terrain was not easy. But we led from the beginning till the end. In the last stage I just wanted to finish the rally and not make any mistakes, since we had a healthy lead. I know the desert terrain here in Qatar, so that certainly helped and gave me an advantage over other drivers. For me physically it was OK, not too demanding, al-Attiyah added. Now the 48-year-old will head to Abu Dhabi for the next round, which will be held from March 30 to April 4. When asked about travelling to Abu Dhabi, al-Attiyah said: 'I am waiting for the green signal from QMMF before I go to Abu Dhabi. We are hoping to do well there. After the Abu Dhabi round, the long-distance FIA World Cup rallies will be held in Turkmenistan, Kazakhstan and Morocco. The shorter Baja-style events in Russia, Dubai, Italy, Spain, Hungary, Poland, Jordan and Portugal constitute a new FIA Baja series. Meanwhile, al-Attiyah also praised Qatar Motor and Motorcycle Federation (QMMF) for holding the ceremonial and closing ceremony at Souq Al-Medina in Pearl-Qatar. 'The atmosphere was wonderful. I want to laud QMMF for hosting the opening and closing ceremonies at Pearl-Qatar, it was a beautiful setting. Pearl is where people come for sightseeing and shopping, and it was good to see the crowd attend the event in large numbers, he said.